Spotted knapweed is a herbaceous perennial. It starts as a rosette for 1-4 years before maturing. Flowering plants have 1-6 stems, sometimes they will have up to 20. Leaves: Leaves are grayish green and are covered with rough hairs. Flowers: The flowers are thistle like and are pink or purple. Flowers will bloom in mid-summer to early fall. Fruits & Seeds: Seeds are dispersed short distances by wind, and long distances by livestock and humans. Roots: Has a taproot and will sometimes have a shallow mat of fibrous roots. 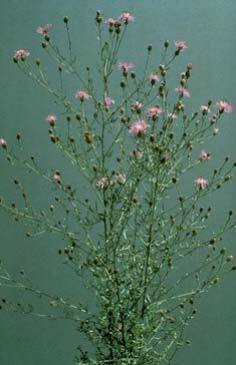 Spotted knapweed invades dry and sandy areas, including oak and pine barrens, prairies, dunes, pastures, and roadsides. The roots exude allelopathic chemicals. It is avoided by both livestock and native grazzers. CAUTION Wear long sleeves and gloves when handling. Spotted knapweed exposure can irritate skin.